The sleekly designed Green Star Elite GS-5000 Jumbo Twin Gear Juicer is the new and improved version of Tribest’s GS Series. This sturdy triturating juicer comes with even bigger, twin conical gears that rotate at 110 RPM effectively minimizing heat production. Along with an adjustable end cap, it crushes, mixes, and squeezes your produce to extract a higher volume of juice. Complete mastication process gently removes the juice while preserving the highest levels of nutrients and vitamins in the extracted juice. The dual stainless steel gears contain magnets and utilize bio-ceramic technologies that pull more nutrients into the juice. The new design features a simple latching system, meaning no more knobs! It includes a coarse and small hole juicing screen, along with a blank homogenizing screen and breadstick/mochi attachment piece. The additional attachments transform it from a juice extractor into a high-quality food processor. Create tasty sorbets, breadsticks, nut butter, and much more! You have the option to purchase a pasta maker set separately to create delicious pasta, as it does not come with the juicer. Also, the soft fruit, adjusting knob successfully increases its effectiveness of juicing soft fruits. Too heavy, the full set weighs almost 26 lbs. You’ll have to push down your produce down the chute with extra effort through the feeding chute. This juicing machine comes with a glass collector pitcher instead of a plastic bowl, which is a nice touch. It is simple to assemble, but one thing that needs to be carefully assembled is the set of twin gears to avoid damaging them when attempting to operate them. Line up the two dots with the one dot to form a triangle to avoid ruining them. You can use the provided drip tray to prevent juice from dripping onto the counter. Prepare your produce before you begin to streamline the juicing process. You will need to cut up larger items, like apples, to make sure they can fit down the feed chute. However, unlike with single-gear masticating juicers, you will not need to cut up celery. The twin-gears cut up the celery without the long fibers wrapping around them. This machine will require some effort especially when you juice dense produce like carrots. Items such as wheatgrass or leafy greens do not need any assistance because they will be pulled down into the machine. It has been recommended that individuals use the wooden plunger over the plastic plunger because if the gears accidentally nick the wooden plunger, the wood will be ejected with the pulp. When it comes to cleaning the Green Star Elite 5000, parts are dishwasher safe and can be run safely through the dishwasher on the top rack. With that said, washing everything in hot, soapy water is always the best course of action. It takes less than five minutes to clean the pieces by hand. It comes with two cleaning brushes, which help you completely clean the components. A nice thing about this model is the new O-ring on the gear housing that prevents leakage of juice, so there is less mess to contend with. It comes with a detachable cord. Scrub the pulp off of the juicing screen. If pulp hardens on the screen, it will be difficult to remove. Wipe the entire base clean with a rag. Dry the parts before reassembling it. Green Star Elite is a powerful triturating juicer, using twin gears that crush, mix, and press palatable juice of the highest quality. It is known for extracting the most juice, expelling the driest pulp, squeezing every last drop of juice. It extracts the greatest quantity of anti-oxidants, enzymes, and vitamins. Additionally, these essential nutrients go through minimal damage as a result of the slow extraction process that reduces oxidation, which speeds up the degradation of the juice. All electric juicers produce foam. There will also be some pulp in the juice. You can easily remove the pulp and foam with the provided sieve. This juicer is perfect for making large quantities for consumption later in the day or even up to 72 hours! Simply ensure that you store your juice in a tightly sealed container to optimally preserve the juice. This juicer is also homogenizer and pasta maker, the good news is this model comes equipped with pasta making attachments. No need to purchase additional accessories. The complimentary homogenizing blank transforms your Green Star juicer into a basic food processor for making sauces, nut butter, baby food and frozen fruit desserts. You can make soy and almond milk using the same blank screen as well. With the pasta attachments you can either make a flat or a round noodle with it but you’ll have to make the dough first. It also includes a breadstick making attachments if you feel like snacking on high carb bread sticks but don’t do that if you’re on a diet. What Kinds of Produce Can Tribest Green Star Elite Juice? This juice press can handle all types of produce–soft and hard produce, leafy greens, citrus fruits, beans and nuts. Hard produce includes cilantro, beets, apple, celery, pear, asparagus, cucumber, pepper, yakon, pineapple, cauliflower, turmeric, watermelon, garlic, pumpkin, coconut, sweet potato, carrots, fennel, broccoli, bitter gourd and ginger. Leafy greens include wheatgrass, beet greens, parsley, cabbage, lettuce, peppermint, basil, kale, spinach, collard greens, pine tree needles, spring onion, dandelion greens, moringa and brussels sprout. Citrus fruits include tangerine, mandarin, lemon, orange, grapefruit and lime. Soft produce such as papaya, tomato, melon, avocado, peach, cranberries, mango, kiwifruit, blackberry, grapes, strawberry and pomegranate can be turned into a puree using the homogenizing screen. 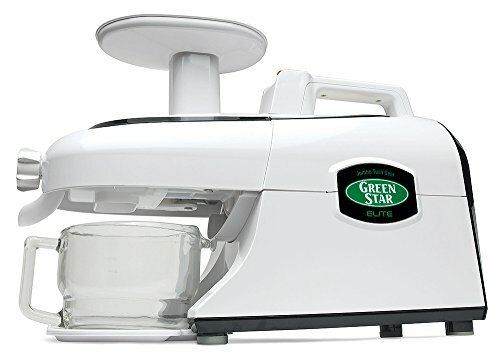 The Green Star Elite GSE-5000 Jumbo Twin Gear Juicer is a top of the line, highly versatile juicer that quietly extracts leafy greens and other vegetables with relative ease producing up to 50 percent more juice than competing machines on the market. Wheatgrass does not juice optimally alone. Alternate it to obtain the best yield, with little foaming. It grinds and presses pretty much all types of produce. You really have to press down with the pusher with a moderate amount of force to push the items through the juicer. If you have any issues that would make using the machine difficult, then opting for a different masticating juicer would be a good alternative choice. Another attractive feature is the 12-year warranty covering the entire juicer. It comes with excellent reviews and is notorious for being the best multifunctional juicer on the market. If you are the type of person that juices on a daily basis, then this juicer is right up your alley. It is expensive and can be found at slightly above five hundred bucks. However, the lengthy warranty covers everything if something does happen with your juicer and it comes with excellent reviews. This durable juicer is definitely geared toward people who are serious about juicing several days a week, if not on a daily basis. With its advanced triple-stage extraction system and sleek new design, the Green Star GSE-5000 is sure to produce nutritious food and juice that makes this juicer one of the top contenders in the market.